What a piece of work Wais Islam is. Maybe, if you can read between the gobbledygook. What does ‘fish pakiland’ mean? Ted you really are a nasty piece of work. The anti-semitic card is what right-wing lazy pundits such as you play when you cannot engage in coherent debates. No wonder you work for the express. Me and wais do not see eye to eye in politics but I can categorically say that he is not anti-semitic. I await your so-called evidence of respect-inspired racist comments. Do not worry I advocate freedom of expression so make it as defamatory as you want. Please learn to debate effectively. Bodrul Islam says “anti semitic” is a term that “right wing lazy pundits use”. So what is islamophobic? Pot and Kettle. “it’s official: many IFE Labour members voted for Ed Miliband. Will they suspend him or let him go cos his co-Jewish financier friends will shove cactus plants up NEC members’ arses…” Or is he just an idiot? I do not see how these statements prove that wais is anti-semitic. The comments are clearly aggressive but I just do not see how they can be generalised as anti-semitic. From what I know Wais is an ardent advocate of palestinian rights who are themselves semitic. Yes ted having anti-palestinian views can also be deemed anti-semitic. It seems ted you are extremely insecure about the prospect of lutfur winning and are engaging in a delirious witch-hunt against supporters of lutfur. As I have said before I challenge you to a public debate on these issues. Are you man enough to come out and face a rigorous grilling? Wais’s sudden conversion to Lutfur is inexplicable. We’ve all been scratching our heads as to his sudden conversion. He wasn’t a supporter of Lutfur before Lutfur was expelled, so why become a supporter after. 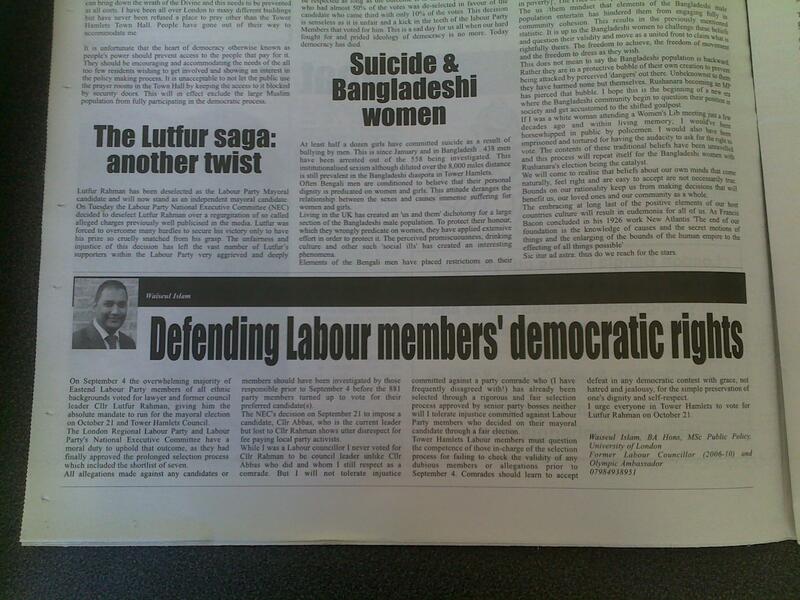 He wasn’t a secret supporter of Lutfur either; they didn’t have a high opinion of him. The point about needing a loan does make me wonder if this could explain the unexplained. After all, there is no shortage of money around Lutfur. I’ve never known a candidate to win a Labour Party selection and throw a £10,000 party. I’d be surprised if Ed Miliband’s team are getting anything more than a crate of beer tonight, and he’s in line to be a prime minister. Right now, I have absolutely no idea why Wais Islam has so suddenly become converted to Lutfur Rahman. It’s inexplicable. The comments about Jewish financiers are prettyndecisive in invoking a nasty old anti Semitic stereotype that has been used against Jews for centuries. Combined with “Jewry” as a term of abuse I think defenders of Wais should think very carefully about what they are associating themselves with. I’m sure there are much bigger fish to go after if you’re talking about anti-semitism and Respect. Let’s ignore Wais. Save his political career… What political career? The voters of Blackwall and Cubitt Town rejected him in May and thats the end of him. To be fair to wais if he stood in the area where he was elected originally he would have won comfortably. He was shafted to another area undemocratically and performed very well in a tory safe seat. Ignore Bodrul Islam’s aggressive bluster, his tedious repetition and his thinly veiled threats. He cannot debate anything without going around and around in circles conveniently ignoring the point of his opponents argument until his adversaries are eventually too bored to care about continuing to play with him. By virtue of having the last word he then struts about proudly claiming victory like a little boy at his first job. When he’s wheeled out to defend someone else you know Respect are desperate. So is the self proclaimed champion of cultural division the best they’ve got? His repeated demands to “come out and show yourself” are the politics of thuggery and intimidation and are precisely the same sort of tactics as used by the Nazis against their opponents during the 1930s. Don’t give him the pleasure of a “debate” because he’s only looking for an opportunity to shout and scream at you so he can impress his new love interest. I’ve seen the ‘extremist’ card used by people to ruin a person. And the race card aswell. It helps to ask questions and understnad what the person is saying first ebfore labelling. Labelling is easy. Lets not over react and get emotional. Words are loaded. Terms are loaded and mean different thinsg to different people. A bizarre comment by h the w, are you trying to be a rapper? Ted avoids the debate because he has no case to answer, especially with regards the ife. If you deem a challenge to a debate intimidating, then I wonder what planet you are from. If you have limited literacy ability you will see I am engaging with the points and ted is staying true to a typical express journalist i.e. No substance. The nazi jibe just shows how intellectually bankcrupt you are. You are insulting the victims of nazi rule. H the w or whatever crap you are, take some valium medication for you are clearly delirious. Take some immodium too, it might mitigate some of your verbal diarrhoea. Ted, you and Gilligan seem to be all out against Respect. Why? What are your motives? are you serving the interests of friends in high places? sad to see journalism is tainted these days with people on personal political interests rather than being impartial! Im loosing respect for this blog by the day. “the first in a series of unsavoury anti-Semitic exposes of Respect-linked comments”, and highlights the statements of Labour member Wais Islam. “What’s this got to do with Respect? I’ve only just looked at your recent posts. The comments made by Wais are simply disgusting and I hope he is ashamed of himself (and so should anyone who tries to defend his remarks). I just hope (and expect) that he at least apologies immediately without any reservation at all. Agree with Rachel, this blog is not about the facts any more, it’s a partisan opinion like so many others. What’s Ted’s reason for so clearly supporting those guys, given what they’ve been up to in control of the council since 1994? Where’s the scrutiny gone? When the bigots resort to insults then the truth is out Ted. The truth is laid bare about the fascism and racism endemic in the Asian, Bangladeshi Muslim community. The truth like their overt hatred is omnipresent and saying otherwise is living in denial.